Music is a huge part of my life and when it comes to the holiday season, I feel like I'm missing out on something if I'm not listening to Christmas music. Some people start listening to it before Thanksgiving, but I'm a stickler on waiting until after Thanksgiving, both to decorate and listen to Christmas music. Just like my holiday decor, I always think I have a lot of Christmas music until I start perusing through it. And then I immediately feel like I need more. 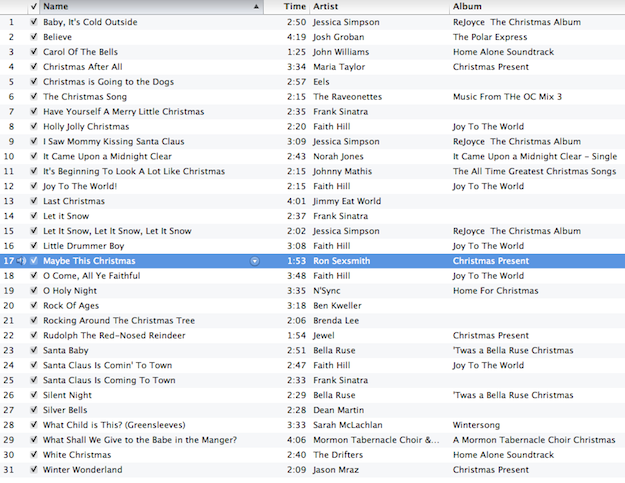 Here's a playlist of some of my favorites from my Christmas music collection as a whole. There are multiple Frank Sinatra and Faith Hill songs on there and that's because I absolutely love their Christmas albums. You'll also notice an N'Sync song on there from the N'Sync Christmas album I got when I was in high school. Don't hate! I'm also really interested in picking up a copy of Michael Buble Christmas album as well. If there's any Christmas music or albums out there you absolutely love that I haven't included on this playlist, please leave a comment and let me know! I'm always on the hunt for more music. A Very Special Christmas is a good album...it has my fave Dave Matthew song that is a MUST download: Christmas Song. I also just bought the Sara Bareilles/Ingrid Michaelson Winter Song. It's hauntingly beautiful.